This novel brilliantly shows us the redemptive power of love and the importance of family. War brutalises but so does poverty. A Hundred Tiny Threads are woven together in this powerful story. Little snags mould characters as well as more dramatic setbacks. This book is far more true to life than a normal romance story. I doubt any reader could predict its ending, it certainly surprised me. There are no rosy tints but grit and determination see Winifred through a life of trials. Always shown, never told, we follow her through challenges that would have defeated many women. Thwarted but never beaten, her spirit remains strong through disillusion, disappointment and heartache. You'll end up willing her on to make a difficult decision right up to the last page. 4.5 starsHow I discovered this book: I'd read the rest of this series and was looking forward to this prequel. I highly recommend the short stories attached to the series, Secrets.This is the fourth book in the Pattern of Shadows series, though in some ways the first, because it's the prequel to the others, which are set in the 1940s, 50s and 60s. I'd recommend reading it first, anyway. It spans the years 1911 to 1923, and tells the story of earlier members of the Howarth family.So, there was me thinking this was going to be an 'eh-up, love, put the kettle on' family drama amongst the cobbles, with a bit of WW1 angst thrown in. I was wrong; it's so much more than that, and far more interesting. The book starts with Winifred Duffy, daughter of 'orrible Ethel, joining up with some enchanting Irish scallywags with irritating dialogue tics who are involved in the fight for the women's vote. The story was jogging along in a modest fashion, until (enter stage left) along came Winifred's grandmother, Florence, who I loved, and whose story was heartbreaking. A moment later I was reintroduced to Bill Howarth (Mr Prologue), a thoroughly unlikeable character who grew increasingly despicable, and all of a sudden I realised I was engrossed. I do love a well-written nasty piece of work, and Judith Barrow has done a masterful job with Howarth. He'd had a bad start in life, yes, but I didn't pity him; my loathing of him grew more intense as the book progressed.The saga moves through the treatment of the suffragettes, lost love, unwanted pregnancy, dark family secrets, the evil, pointless horror of WW1, the general godawful fate of the impoverished classes, the 1919 influenza epidemic, the atrocities committed by the Black and Tans ~ this is no rose-tinted piece of nostalgia, and no detail is spared. Saddest of all is the life of Winifred, in many ways; although she finds some degrees of happiness, the theme all the way through seemed to be how women of the time had to put up and shut up, and accept what they got, even if it was so much less than they deserved. This aspect of the book is so well done, without being hammered home. I was pleased that, although there was resolution, there was no great happy ending. 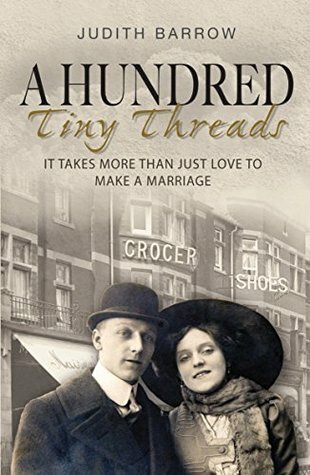 100 Tiny Threads is about real life, and quite an eye-opener it is too; it made me glad I wasn't born fifty years earlier, for sure.When I got to the end, I wanted to nip back to Pattern of Shadows, set in WW2, to find out what happened to Bill and Winifred; it's two or three years since I read it, and I can't remember. D'you know, I think I will. A good saga, worth the read. Some errors need to be corrected (hence, the lower rating), but not distracting enough to compromise the story, which is interesting and historically pleasing. A family living through major global events in Britain, well researched and documented. I recommend all of Judith Barrow's works. She devotes much time, emotion, and drama to her characters and the plot. This book wets the appetite for more literature from this author.